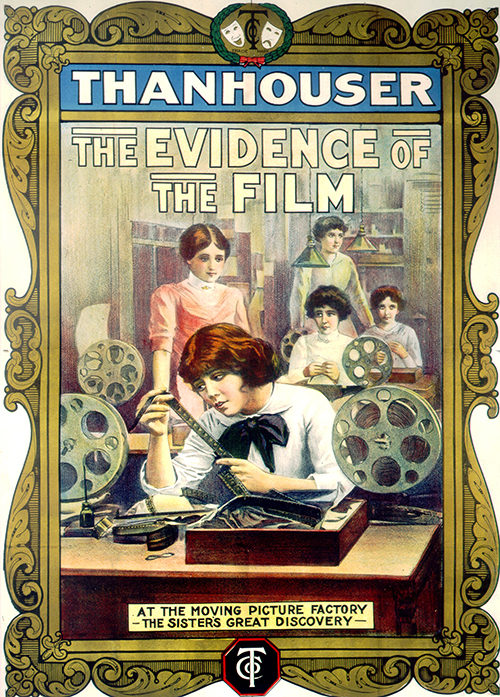 The making of motion pictures, subject of general interest to patrons of theatres, is treated in the Thanhouser film entitled The Evidence of the Film, to be released January 10. Among other things it shows a company of photo players producing a street scene, and then follows the film through all mechanical processes until the completed picture is ready for distribution. The Thanhouser company has reason to expect a large demand for this release. A girl who worked in the joining room of a motion picture factory had a little brother, of whom she was very fond. He visited the plant one day, and saw from 'the inside' how pictures were made. The youngster was a messenger boy, and later he was summoned to the office of a broker and given a package which he was to deliver to a rich woman uptown. The woman received the package herself, opened it in his presence, but found only bits of blank paper, instead of the bonds she had expected. At first she suspected the broker, but he clearly proved that, in the presence of two witnesses, he had placed the bonds in an envelope, and carefully sealed them up. The messenger boy protested his innocence, but the woman and broker both insisted that he be prosecuted, and the weeping child was locked in a cell. A sister pleaded with his accuser, but in vain, and for several days the case against the boy was dark. One morning while joining film the girl happened to glance with extra care at one scene. She thought she recognized her brother, and close examination under a microscope proved to her that she was correct. With a cry of joy she rushed to the police station and told the officers in charge that she had important evidence. Two detectives accompanied her back to the plant, and saw a scene of a play thrown upon the screen. It revealed the messenger boy, package in his hand, coming around the corner, whistling merrily. A man close behind him ran into and upset the child, deftly substituted a package he held for the one the boy had dropped, and then walked down the street so rapidly that he did not notice the camera. 'Don't you know that man?' screamed the girl. 'He is the broker who had my brother sent to prison.' The broker was arrested, when the evidence of the film was displayed to him he broke down and confessed. He had hoped by throwing the blame upon the boy to keep the bonds to himself. A long term in prison was his punishment, while the plucky girl was warmly complimented for the shrewd way in which she cleared her little brother. Of the many, many novel pieces of business introduced in motion pictures none is more modern and original than is this on which hinges the story. The offering gives the spectator a glimpse into the making of films and this adds to the interest. The little hero of the play has a sister who works in the joining room of a motion picture plant, and she shows him how motion pictures are assembled and put together. He is a messenger boy, and is called upon by a broker, who sends him uptown with a package of bonds. On his arrival the package is opened, but there are no bonds, and the woman to whom they are delivered orders his arrest. The boy's sister is frantic, but believes in the innocence of her brother. The next day while at work she sees a picture of her brother, and with her magnifying glass identifies him and proves his innocence. A motion picture had been taken as he was walking along the street from the broker's office. A man ran up behind him, deftly knocked the package out of his hand and substituted another in its place. The man was the broker. The film was developed and the proof of the broker's guilt was established beyond all doubt.